MONTGOMERY, Ala. (TAB) — Sen. Del Marsh’s gambling was approved by the Senate Tourism and Marketing Committee on Aug. 4 and will move into the full Senate. News sources say the committee’s approval of the bill was not a surprise as Marsh, R-Anniston, is chairman of the 8-man committee. The gambling bill, Senate Bill 453, would create a state lottery and legalize casino-style gambling at the state’s four dog tracks. Under the bill a “gaming commission” also would be formed to oversee gambling and would be allowed to bid out gambling rights to other owners, but not for 20 years. 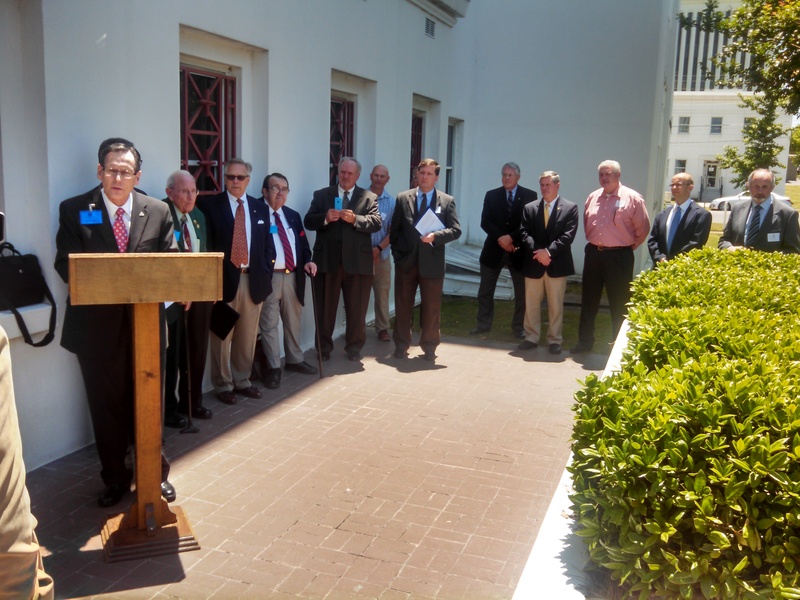 Joe Godfrey (left) and others speak against gambling at a May 6 press conference in Montgomery. Photo by Keith Hinson. Alabama Citizens Action Program Executive Director Joe Godfrey and former Auburn University head football coach Pat Dye were among those who addressed the committee shortly before it voted. Godfrey was opposed and Dye was in favor of the bill. It is not clear whether the controversial bill will come up for a debate before the Senate. To read Jennifer Rash’s, executive editor of The Alabama Baptist, story on the discrepancies of Marsh’s gambling research, go to www.thealabamabaptist.org. This entry was posted in Home and tagged Alabama, gambling. Bookmark the permalink.